This artist's rendition of the super-Earth GJ 1214b shows it in orbit around a dim red dwarf star. If the atmosphere is thick in hydrogen, scientists may be able to spot signs of alien life. Detecting signs of life very different from that of Earth in the atmospheres of alien planets may be difficult, but it is possible, researchers say. A team of scientists examined models of "super-Earths" — exoplanets slightly larger than Earth — to determine how easily signs of life could be spotted. They determined that such biosignatures could be identified more easily on planets orbiting stars producing relatively low amounts of radiation — but even then only if everything worked out just right. "What we've been trying to do is move away from that," William Bains, also of MIT, said during the Astrobiology Science Conference in Chicago in June. Bains worked with Seager and Renyu Hu to study super-Earths with hydrogen-rich atmospheres. "We wanted to build a model of biosignatures independent of Earth's biology." Super-Earths are worlds up to 10 times more massive than our planet. Because of their size, they are more likely to retain an atmosphere rich in molecular hydrogen. The girth of super-Earths also makes them easier to discover, and their atmosphereseasier to characterize, relative to their Earth-size cousins. Hydrogen-rich super-Earths are now known to be quite commonthroughout the galaxy. To search for biosignatures, Bains said, it's important to understand why forms of life produce gas in the first place. Some gas is produced as a byproduct when energy is captured from the atmosphere. Other gases are byproducts of metabolic reactions, such as photosynthesis. The third type is created by life not as a result of its central chemical production but from stress, for signaling and in other functions. "Life is a dynamic process," Bains said. After determining what gases could survive in the atmosphere, the scientists then calculated how much biomass would be needed to produce a detectable amount, and whether or not such an amount of life would be reasonable to find. The team found four volatiles that would be generated by the production of energy in a hydrogen-rich atmosphere. Of them, three could be formed geologically, making them unreliable biosignatures. "This was really disappointing," Bains said. The only interesting biosignature that the team came up in the first class was ammonia (NH3). For ammonia to be created, life would have to find a way to break the bonds between molecular nitrogen and molecular hydrogen. On Earth, synthetic chemistry can break each molecule apart individually, but no known system is capable of breaking both at once. Still, the team remains hopeful that a form of life could evolve on other worlds capable of capitalizing on the possibility. Producing a detectable amount of ammonia in the atmosphere of a distant super-Earth would require a layer of life less than one bacterial cell thick, researchers said. "Even if it was deader than the deadest place on Earth, we could detect it," Bains said. That's the case for super-Earths orbiting sunlike stars, anyway. 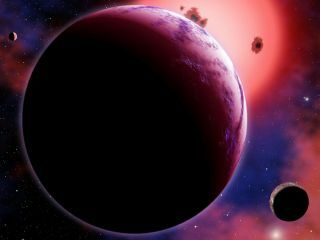 For alien planets receiving lower levels of ultraviolet radiation, such as those orbiting standard or quiet red dwarfs, the required biomass would need to be significantly higher. While scientists should be able to detect ammonia in the atmosphere of distant planets, determining if it stems from life is another matter. At present, uncertainties about the size and mass of exoplanets remain high enough that worlds presently thought to be super-Earths could, in fact, be mini-Neptunes, gas giants smaller than those found in the solar system. Even if scientists could conclusively identify a planet as rocky, it's possible that the world could have collected ammonia during its evolution, as Saturn's moon, Titan, did. Ices on the surface could break down with either internal heat or with the help of ultraviolet radiation, releasing ammonia into the atmosphere to create a false positive. So, without getting up close to these distant worlds, characterizing whether ammonia in the atmosphere comes from life remains a significant challenge. The research that formed the basis of Bains' talk at the astrobiology conference was published in late 2013 in The Astrophysical Journal. Seager, Bains and Hu also considered another group of gases — those produced for biomass building. Capturing energy from the environment requires energy. On Earth, a prime example is the oxygen plants release during the process of photosynthesis. Unfortunately, the team was unable to identify any potentially useful biosignature gases of this type in a hydrogen-rich atmosphere. The gases that life might produce would be expected to exist naturally in the atmosphere of such a world, Bains said. As a third option, the team examined molecules produced unrelated to energy generation. The presence of such gases would depend on the amount of ultraviolet (UV) radiation in the atmosphere, because high UV levels lead to the creation of lots of destructive hydrogen ions. Planets orbiting sunlike stars, which emit lots of UV light, would therefore need an enormous density of biomass to produce biosignatures high enough to reach detectable levels. Even around a normal red dwarf, the values would need to be high, though they could be plausible when compared to Earth's biomass surface density range. According to the team, the James Webb Space Telescope (JWST) could spot evidence of biosignatures gas "if and only if every single factor is in our favor." Detecting life using JWST would require a pool of transiting planets around nearby red dwarfs. Because the stars are so dim, they would need to be relatively close to Earth in order for scientists to study their planets. These planets would need a molecular hydrogen atmosphere, which would be easier to study than a more Earth-like atmosphere. The star itself would need to be quiet, with little radiation. Finally, the planet itself must have life that produces a detectable gas as a biosignature. "We will have the ability to predict some biosignatures gas independent of Earth," Bains said. "But it's going to be really hard to detect."